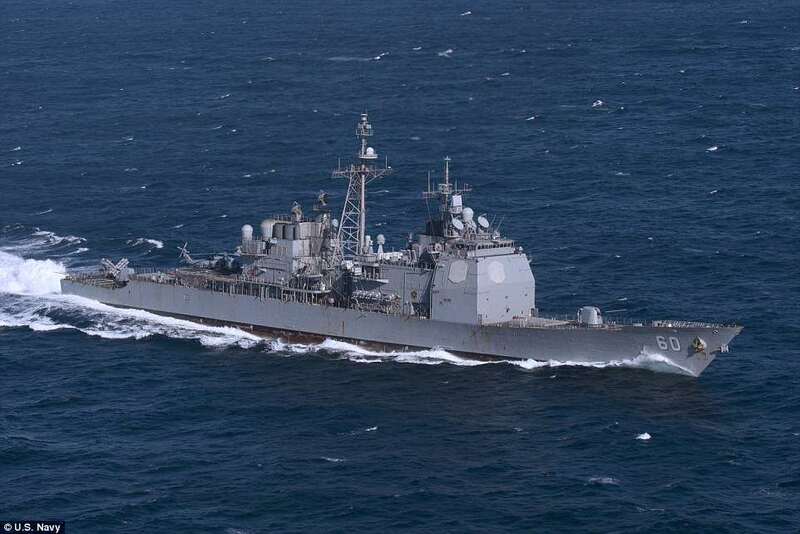 A huge task force of 12 warships is setting sail for Syria in one of the biggest concentrations of US naval power since the 2003 Iraq invasion, it has emerged. The giant nuclear powered USS Harry S Truman, carrying 90 aircraft and escorted by its five-strong strike group of destroyers and cruisers, is powering towards Europe and the Middle East. 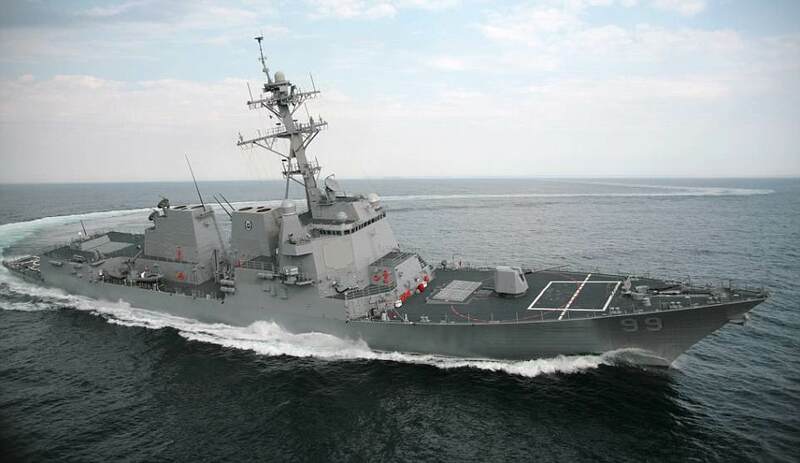 A further four destroyers are believed to be in or near the Mediterranean already, including the Donald Cook, Porter, Carney and Laboon along with two nuclear-powered submarines, Georgia and John Warner. The deployment of 12 US warships on one mission is a huge concentration of fire power, one of the biggest since six aircraft carriers supported the 2003 invasion of Iraq. It comes amid heightened tensions as Donald Trump continues to consider launching airstrikes on Syria in retaliation for a chemical gas attack in a rebel-held town on Saturday. Russia has threatened to take down any missiles launched at the Assad regime's forces using its fearsome S-400 defence system. Syrian dictator Bashar al-Assad has reportedly moved his military assets to Russian bases in the country in the hope that the US and its allies would be reluctant to launch strikes anywhere near Vladimir Putin's forces. 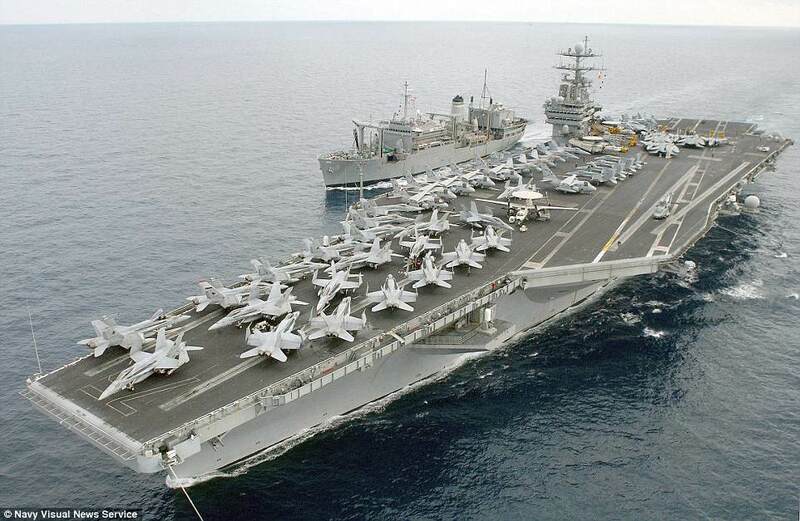 The giant nuclear powered USS Harry S Truman, carrying 90 aircraft and escorted by its five-strong strike group of destroyers and cruisers, is powering towards Europe and the Middle East. 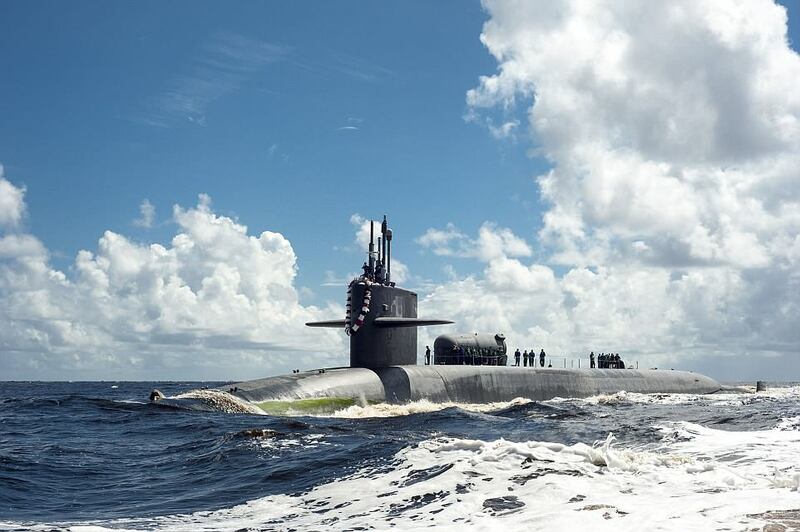 In total the Truman will be accompanied by two submarines (USS Georgia and John Warner), nine destroyers (USS USS Donald Cook, Porter, Carney, Laboon, Farragut, Forrest Sherman, Bulkeley and Arleigh Burke) and one missile cruiser (USS Normandy). On Thursday, the White House said that a 'final decision' had not been made on Syria. Donald Trump had said earlier in the day that Americans won't have to wait long for a response to Saturday's horrifying chemical weapons attack on a rebel-held town that left at least 40 dead and others gasping for air. But at least two of his top advisers couldn't agree on whether there's sufficient proof to blame the atrocity on dictator Bashar al-Assad's government, leaving the possibility of a retaliatory attack an open-ended question. America's allies and adversaries alike were awaiting a signal from the White House about whether Trump will follow through on his warning that missiles 'will be coming,' potentially putting Russian troops in harm's way. At close of business, the White House said that Trump had just concluded a meeting with his national security team and would be speaking again later to the heads of government in France and the U.K. But on Capitol Hill, Defense Secretary James Mattis told the House Armed Services Committee that the U.S. hasn't reached any conclusions. The USS Harry S Truman and its support ships were due to leave Naval Station Norfolk in Virginia on Wednesday. It is accompanied by the cruiser USS Normandy and destroyers USS Farragut, USS Forrest Sherman, USS Bulkeley and USS Arleigh Burke. Also among the strike group's ships is the German frigate FGS Hessen, a state-of-the-art vessel specialising in air defense. 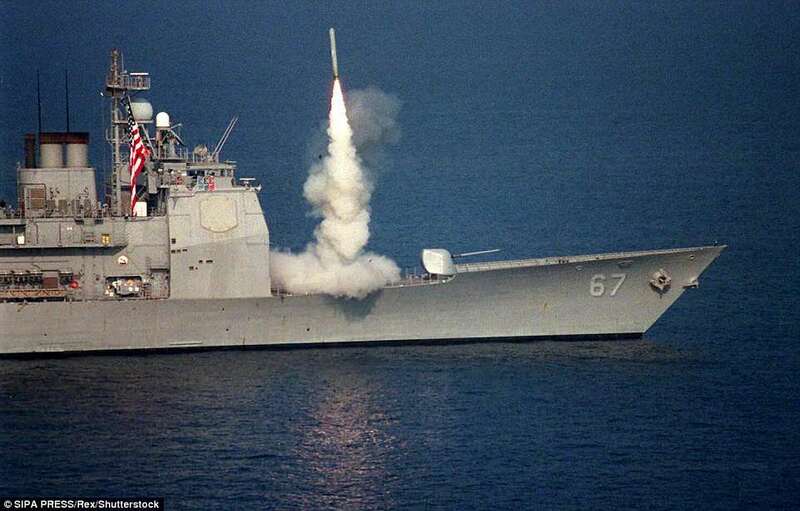 US Navy officials said the Hessen is the only type of ship in the Western world with three kinds of surface-to-air missiles. Its radar has a detection range of more than 200 nautical miles for air targets. Already in position is the USS Donald Cook, an American destroyer equipped with up to 60 Tomahawk land attack missiles. 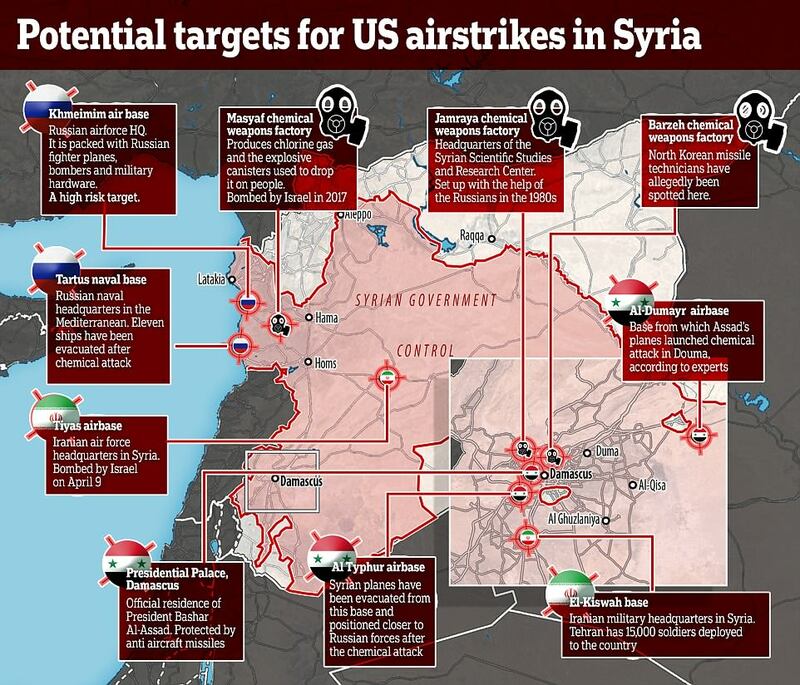 In April last year Trump ordered 59 Tomahawk strikes on the Shayrat Airbase in response to a chemical weapons attack on rebel-held Khan Sheikhun. 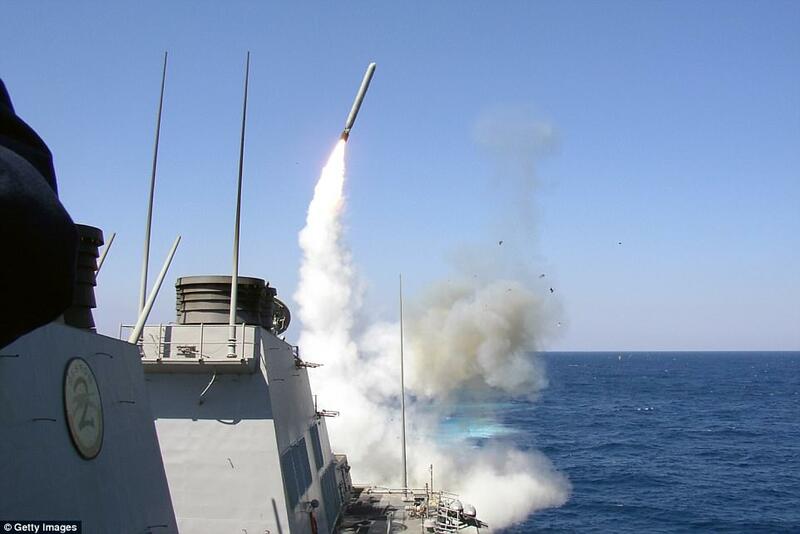 These strikes were launched from two US warships stationed in the Mediterranean. Trump and his national security aides on Thursday discussed US options on Syria, where he has threatened missile strikes in response to a poison gas attack, as a Russian envoy voiced fears of wider conflict between Washington and Moscow. Worries about a confrontation between Russia, Syria's big ally, and the West have been running high since Trump said on Wednesday that missiles 'will be coming' in response to the attack in the Syrian town of Douma on April 7, and lambasted Moscow for standing by Syrian President Bashar al-Assad. 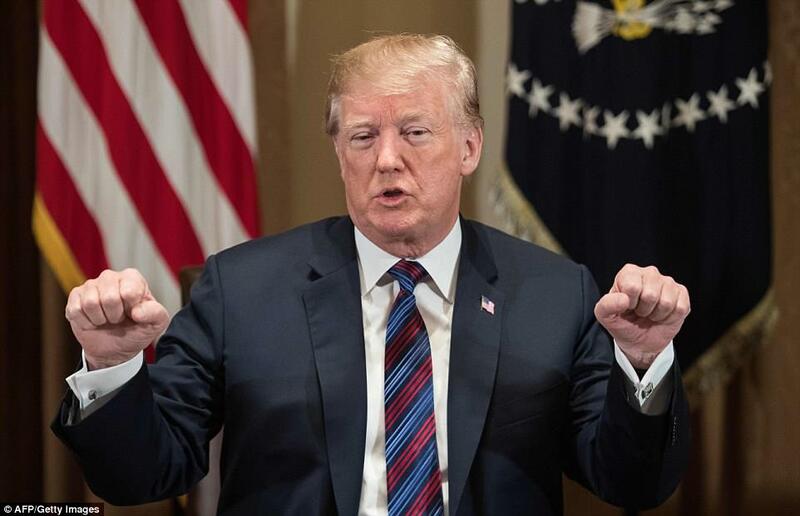 Trump tempered those remarks on Thursday and even as he consulted allies such and Britain and France, who could join in any US-led strikes on Syria, there were signs of efforts to prevent the crisis from spiraling out of control. 'Never said when an attack on Syria would take place. Could be very soon or not so soon at all!' Trump wrote on Twitter, raising the prospect that an attack might not be as imminent as he seemed to suggest the day before. Trump met his national security team on the situation in Syria later in the day and 'no final decision has been made,' the White House said in a statement. 'We are continuing to assess intelligence and are engaged in conversations with our partners and allies,' it said. Trump spoke to British Prime Minister Theresa May on Thursday and the two leaders talked about the 'need for a joint response to Syria's use of chemical weapons,' the White House said. May's office said they agreed on the need to deter Assad's government from further such attacks. Trump was also due to speak with French President Emmanuel Macron, who said France had proof the Syrian government carried out the attack near Damascus, which aid groups have said killed dozens of people, and will decide whether to strike back when all the necessary information has been gathered. 'We have proof that last week ... chemical weapons were used, at least with chlorine, and that they were used by the regime of Bashar al-Assad,' Macron said, without offering details of any evidence.